You apply the brakes and the truck stops. Simple. Until it’s not. Just about every truck driver is going to experience brake fade, which is most accurately and scientifically described as “the condition in which the thermal capacity of the braking system has been exceeded and the system operates at reduced effectiveness.” More to the point, it’s pushing that brake pedal and not having things go the way they should. There are varying degrees of brake fade: It could just mean having to apply more pressure to get the stopping power that a lesser application had been achieving; it could be dramatically increased stopping distances; or in the worst case, it could be mashing the pedal to the floor and getting virtually no stopping power. From a fleet perspective, brake fade not only affects driver and road safety, it negatively impacts other operational aspects as well. 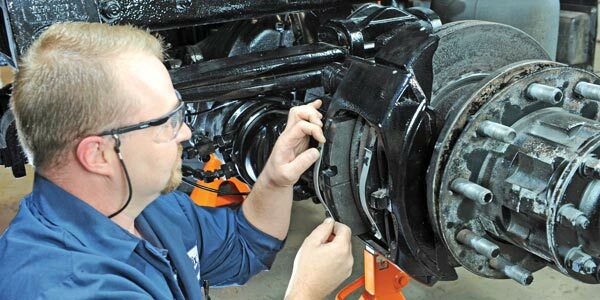 Select axle combinations with brakes that are fading on a tractor or trailer means other brakes must make up the work that the faded brakes aren’t achieving, shortening the life of those brakes. That can lead to additional downtime and maintenance costs, lowering return on investment in equipment and technologies. Fortunately, brake fade is also a matter of science, which means it can be minimized. In all cases, brake fade is directly tied to heat. When it comes to brakes, heat is the enemy of performance: The hotter a brake gets, the less effective it becomes. In trucking, brake fade is most predominant in drum brakes, due to their design. While today’s advanced drum brake friction does reduce fade in comparison to earlier formulations—particularly those prior to the 2013 federal Reduced Stopping Distance mandate—a fair amount of industry confusion still exists about temperature, brake friction and performance. These three points represent the full temperature range experienced by the major drum brake components during an application, and it’s important to establish them as points of reference. Because a brake system has a wide variety of components, each with unique thermal properties, it’s almost impossible to single out one temperature point as the most critical. Temperatures during a brake application at the engagement point can briefly surpass 1,000°F, which makes it the ideal place to focus on understanding brake system temperature. All the heat generated at engagement needs to go someplace, and it begins by transferring largely into the drum, which acts as a “heat sink” and gets warmer. Under normal conditions, the typical ranges for bulk drum temperature is 300-500°F, while the bulk lining temperature tends to run between 200-300°F, depending on the friction. As stops become more frequent or intense—or in severe brake applications like long downhill stretches—heat continues to transfer into the drum, raising both the bulk drum and bulk lining temperatures. Bulk drum temperatures can reach up to 600°F, and bulk lining temperatures can approach 500-550°F. The goal of brake and friction design, then, is to maintain the lowest possible braking temperatures. Reduced temperatures lower the risk of loss of stopping power—brake fade—while also extending lining life. It’s important to remember that the elevated temperatures at the engagement point of the friction and drum dissipate almost immediately. Although it may be possible to measure 1,000°F on the drum surface during engagement, prolonged exposure at this temperature will lead to the failure of any non-asbestos organic (NAO) friction. While some severe-duty applications may require a higher grade of friction to better withstand increased levels of heat, placing too much emphasis on keeping brake temperatures low can lead to a misplaced reliance on brake-lining temperature ratings, particularly those that claim ratings of 950° to 1,000°F. • SAE J2115 (Section 7 – Wear and Effectiveness at Temperature)—Measured at 250°, 350°, 450°, 550°, and 650°F. Neither of these tests references or makes a recommendation on “temperature ratings” for brake friction, because without specific information on what temperature is being measured—bulk drum or engagement —and where the readings are being taken, friction temperature ratings are numbers without context. Actual friction life and performance will be dictated by resin quality and performance in the SAE temperature wear section. 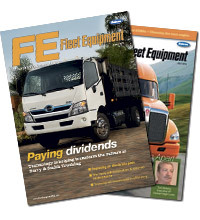 Fleets considering friction for severe-duty applications should request the results of both the FMVSS 121 and SAE J2115 tests, even if a supplier has provided temperature ratings that far exceed normal system operating temperatures. Regarding specific temperature claims, it’s important to know whether they’re measuring bulk drum or engagement heat, and where it was measured. The only reading that can be easily obtained without equipment such as thermocouples is the bulk drum temperature. And if the bulk drum temperature is anywhere near 1,000°F after brake operation, something is very wrong with the brake and could even lead to a fire. Only brief in-stop drum brake temperatures should ever exceed 600°F. If drum brake lining spends an extended period at 600˚F or more, tire bead damage can occur. Selecting the proper friction can help reduce the effects of brake fade, especially in severe-duty applications. 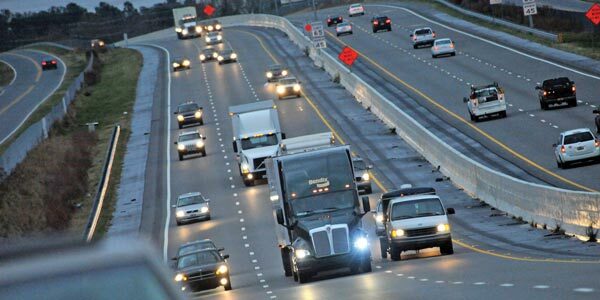 Familiarity with proven industry standards, as well as the science and reasons behind friction design and recommendations, goes a long way toward making the right choices to meet fleets’ needs, and keeping trucks on the road and operating safely. Wider drum brakes—which dissipate heat more effectively than smaller brakes—along with proper slack adjuster maintenance and adjustment, are also options that can help prevent brake fade. But there is another equipping decision that a growing number of fleets are making. There are two major reasons that air disc brakes (ADB) exhibit a far lesser degree of brake fade than their drum counterparts, both attributable directly to the basic design of an air disc brake: First, an ADB’s friction and rotor are exposed to much more air flow than the drum and lining, allowing heat to dissipate more quickly; compared to a drum brake shoe and the inside of a brake drum which has much less air flow (especially when you include dust shields). Second, when heat in an ADB system causes thermal expansion of the rotor, it actually brings the rotor and friction in closer contact. By contrast, when a brake drum expands due to heat, it expands away from the friction, meaning the brake shoe must cover a greater distance to generate the stopping power—which is itself a contributor to drum brake fade. Disc brakes also have less of an impact on tire bead temperatures because their design allows more air flow, providing increased cooling. Drum brakes do offer a lower initial purchase price, and even though ADBs might be standard, truck manufacturers may offer levels of delete credits to fleets preferring drums. Still, by the end of 2018, the ADB take rate on North American tractor wheel-ends will be more than 25%—a more than 30% year-over-year increase from 2017. That number is projected to climb and will likely surpass one-third of all Class 6-8 air brake installations beyond 2020. In many cases, fleets are mixing ADBs with drum brake axles, such as ADB on the front steer axle only, or combinations of tractors with ADB and trailers with drum brake. These combinations will yield improved stopping distances and exhibit reduced impacts of brake fade. Additionally, since the ADBs can pick up extra work without adding brake fade, they help reduce some of the heat that could cause drum-braked axles to experience fade. The more axles a vehicle has equipped with ADB, the shorter the stopping distances are, along with reduced risk for brake fade. Taking that last point into consideration also underscores the impact that equipping trailers with ADB can have on addressing brake fade, improving stopping power and increasing ROI on air disc brakes. Since trailers have a longer trade cycle than tractors, they provide more of an opportunity to realize advantages. Electronic stability control (also known as “full stability”) has been widely available in the North American commercial vehicle market since 2005 and mandatory since August of 2017. Built on the foundation of antilock braking systems and additional sensors, full stability forms the base technology for ever-advancing driver assistance systems, including collision mitigation technologies. Similarly, trailer antilock braking systems help address and mitigate conditions that may lead to rollovers. As these systems become more complex and levels of automation increase, unlocking capabilities like platooning, the criticality of reliable brakes will only increase. Optimal performance of these higher-level safety systems depends significantly on properly spec’d and maintained brakes, equipped in configurations that will minimize fade. Nobody wants an automatic emergency braking system hampered by brake fade. Apply the brakes and the truck stops. It’s as simple as that—and the right decisions can keep it that way. 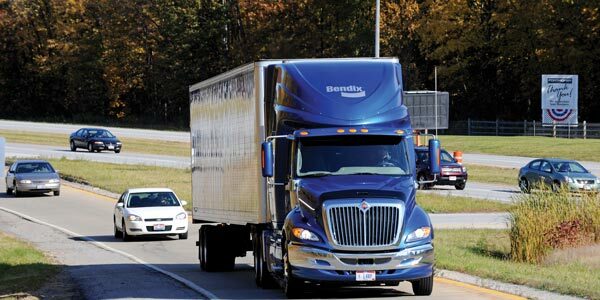 This article was contributed by Keith McComsey, the director of marketing and customer solutions—wheel-end with Bendix Spicer Foundation Brake LLC.